I absolutely adore Jimi Hendrix (and his music isn't so bad either) and one of my favorite songs is "Manic Depression". 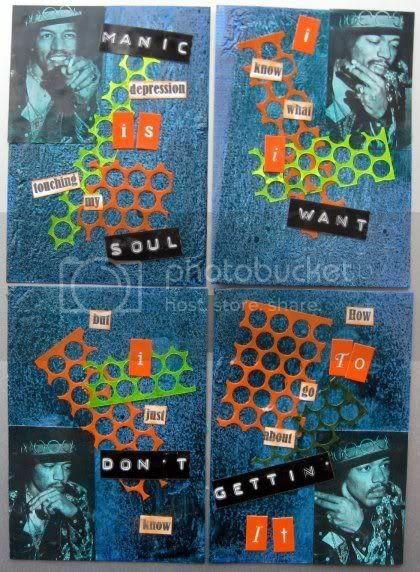 I found these four little pictures of Hendrix and decided to make a set of ATCs inspired by Hendrix and "Manic Depression". So let me just say that these four little ATCs took me about 3 months to do. It was one of those projects where I'd pick them up, get stuck, put them back down. Pick them up, move them out of my way, put them back down. Pick them back up...well, you get the idea. At one point, I painted them in different colors and then used Elmer's glue to make a crackle effect which was a technique Gabrielle (on the LPS Design Team) taught us at the message board. Although the more I looked at them, they didn't seem so bad. But lesson learned, bring a ruler next time I try spraying anything with anything. I like your creativeness and so cool using the Hendrix images. Colors are good and nice to have a set. A while back I had some Marilyn Monroe playing cards and I altered them too. I need to post pic's - some of them are funny. I love how you did yours,aren't ATC's fun ??? Do you like working with this small format ? awesome! how cool are you?! Thank you very much for your sweet comment, my dear! Oodles of hugs! Great job....kinda like a blue haze that I'm sure he was in when the original pix were taken!! I am not a Hendrix fan but I am definitely an ATC fan...these are so cute. The other day at Micheals I saw a 16x20 frame made to display trading cards...I think I am going to get one for all of mine to hang in my scrap area. Oh my daughter loves Jimi! Oh wow, awesomeness. Love these little gems. Definitely love the blue Hendrix! These are superb! Amazing. Gosh you crack me up! I think they look great lol! YOu are so funny. So, I am so surprised that Jillian and Ed are still together and moving in together...WOW quick lol! Good for them though. Oh by the way Traci is starting on my blog design NEXT week! YAH I am super excited!! Maggi, they are sooo cool!! This is soo totally something I would do!!! Maybe it's a good thing I haven't gotten my hands on any Maya mist yet! I kinda like the blue look for Jimi though! the cards are great. WTG girl! Oh my- these just ROCK!! LOVE the misting even though it was "your first time" LOL! These really do rock lady- nice work! Haha...Maggi, I had the same thing happen to me when I was spraying something. I'm terrible at math...but oh well, got the job done along with everything else! Those are AWESOME by the way!! You are such a wonderful artist! That turned out really great!!!! I love how versital your talent is! I have a whole room full of "stuck"! Can you come un-stuck me? Love your project Maggi, so creative!!! oooh I just love these atc's amazing! I never follow instructions most of the time...sometimes there are happy accidents...Or it just gets messy..lol. Those are so cool! I haven't created anything in a while. Maybe once the kids are back in school I can get with it. Oh my goodness! I love Manic Depression and I never thought of making anything so cool. Love the label maker strips and the punchinella. These are gorgeous. Thanks so much for the link.